Egyptian Court Overturns Hosni Mubarak's Final Conviction : The Two-Way The ruling, which throws out an embezzlement conviction, means the former Egyptian dictator could be set free soon. Ousted four years ago, Mubarak also saw a murder conviction overturned in November. 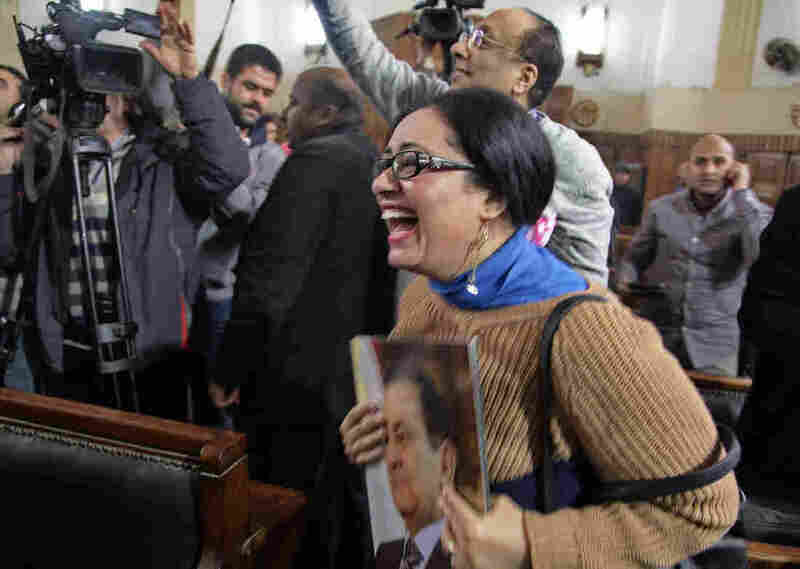 A supporter of ousted President Hosni Mubarak reacts to the verdict Tuesday ordering a retrial. An Egyptian court has thrown out the final conviction against the country's former dictator Hosni Mubarak. The court said that proper legal procedure was not followed in the embezzlement case against Mubarak, so he should be retried. But, as The New York Times reads the decision, this might mean that Mubarak could be freed in short order, because he has already served "more than the three-year sentence for corruption that was overturned on Tuesday." The Egyptian newspaper Al-Ahram quotes a "judiciary source" who says Mubarak will be released "because he is not being tried in any other case." This has been a long and dramatic road for Mubarak, who was toppled after decades of rule during an uprising in 2011. He was tried and convicted in the murder of hundreds of anti-government protesters during the uprisings. But that conviction — and the life-sentence — was overturned last November. "Though the ruling paved way for Mubarak's imminent release, there was no explicit statement from the authorities that he would leave the hospital in Cairo where he was held in custody a free man. There were also conflicting remarks over whether the release would take place. "An official at the chief prosecutor's office told The Associated Press that 'paperwork was being processed' for Mubarak's release. The official, who spoke on condition of anonymity because he was not authorized to talk to media, declined to speculate if and when that could happen. "However, an unnamed security official told the state-run news agency MENA that Mubarak will remain in detention since the Appeals Court ruling didn't include a release order." The Times adds that Mubarak's release could present Egypt's current president, Abdel Fattah el-Sisi, with an uncomfortable political situation. "It would be the first time in Egyptian history that a former president was allowed to live freely and speak openly. Previous presidents have either left the post in military custody or died in office. "Mr. Mubarak could begin publicly defending his tenure, criticizing Mr. Sisi's policies, rallying his former loyalists in politics and government, and weighing in on parliamentary candidates — any of which could prove awkward for the current president."